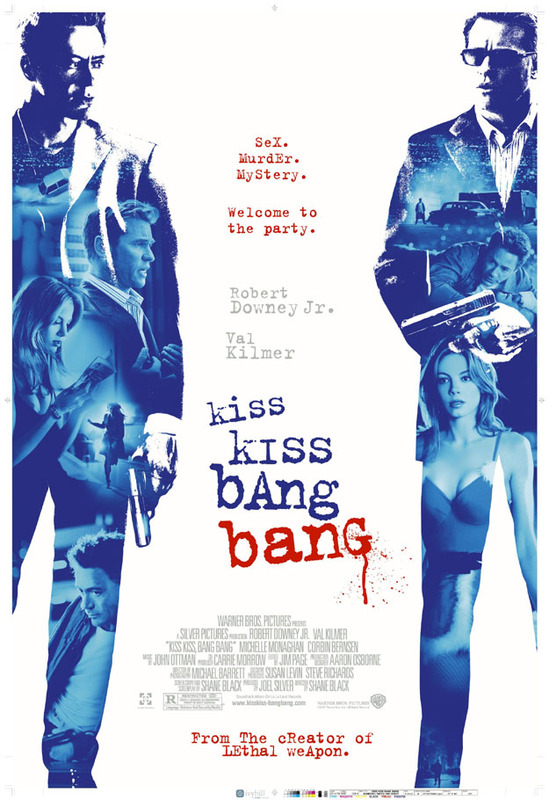 Kiss, Kiss, Bang, Bang, 11 September 2005 Author: nelson4-1 from Canada When is the last time you remember a hero in a witty, smartly written comedy, contain so much vulnerability, sweetness and charm you want to fall immediately into his big brown eyes? When is the last time you recall observing a buddy comedy where the lead is not some smug, abrasive SOB, you really could care very less about once the lights are switched back on after the film ends? When is the last time you observed Robert Downey Jr. portray any role where he didn't completely convince you that he and the chosen character are synonymous in every way? When doesn't Downey own his character's persona, his essence, his raison d'etre?What a refreshing and welcoming face his was this morning to the big screen of this hilariously funny film, curbed by a dash of sentimentality and realism. 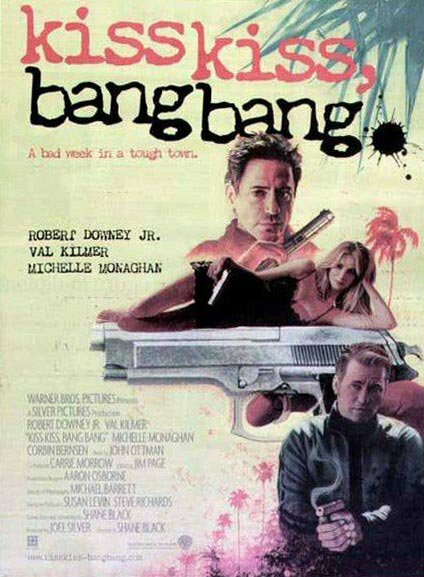 This movie, translated into a screenplay by Shane Black, pits Downey's bumbling, goofy, somewhat old fashioned, but genuine Harry Lockhart, against the backdrop of Hollywood's loathsome underbelly, dank streets, faux people and superficiality. A place embodied either by people on their way up or on their way down, Harry Lockhart doesn't pretend to comprehend LA, but the pureness of his heart cuts through it's facade like a knife. He calls it as it sees it while inadvertently revealing it's ugliness and hollow center. Harry is the quintessential stranger in an even stranger land.This script is sharp and quick, just as so many critics have already pointed out, but what makes it vibrant is the indelible, offbeat camaraderie and compatibility between Downey and Val Kilmer, private detective, Perry Van Shrike. Two very unlikely candidates for the classic buddy flick, but then there isn't anything usual about this picture. Kilmer described the chemistry between himself and Downey, by claiming Robert represented Jerry Lewis to his Dean Martin, and that would be an appropriate description, except for one thing. Downey's rare gift as an actor is his ability to bring impressive and considerable weight to all of his roles, even when called upon to be light. There are a few outstanding dramatic moments during this entertaining film that took us quite by surprise, dangled in front of us just long enough to give the audience a break from the laughter. Yes, laughter. This is a film where there are so many comedic moments, the audience alternately clapped and laughed out loud for much of the ride. Without giving too much away. ***SPOILER*** Watch for a scene where Harry accidentally pees on a corpse while preparing to go to bed. There are a few uproariously raunchy but funny parts like this one and they are executed with such flair and in a non-offensive way, you can't help but become caught up within the fun of the flick.Kilmer gets off some killer one liners too, but be careful to pay attention, you won't want to miss a single word of dialogue. These characters are as unique as they are complex and engaging all the way, but Downey's Lockhart will easily win over the hearts of even the crustiest and jaded movie goer. Toward the end of the film you will root for Harry as we did while he wearily, lazily shoots all the bad guys, out of aggravation more than anything else. He simply couldn't handle dealing with them anymore and as the last one fell to his knees, we applauded emphatically for our Columbo like, anti-hero with immense grins on our faces.Downey and Kilmer are equals in this journey of corpses, plot twists, U-turns and dead ends, as they adeptly bat back and forth clever insults, delivered with hilarity and precision. Michelle Monaghan, who plays Harry's former childhood friend and love of his life, is a stand out here and possesses a real fire and intensity about her that is extremely likable and original. I can't imagine anyone else playing Harmony Faith Lane to Downey's Lockhart with such conviction. They share a combative but tender relationship as Harry, who is perplexed about many things, grapples to understand how their two lives managed to derail over the years when they'd started out so right. Or so it would seem. Fortunately for Harmony and Harry, and for us, they somehow find their way out of the dark and into the light while winding up at the same place they started.Director Shane Black was on hand this morning to present the film and it's stars and he basically cut to the chase with some key points. Number one: Don't take the movie too seriously and have fun with it. Number two: Although many people at first questioned casting two notorious actors like Downey and Kilmer as co-stars, Black and company are more than pleased with the end results and how well this film has played at festivals, so far. He didn't believe the casting of Harrison Ford would have improved the movie's perception or popularity. Number three: Since he's on a bit of a comeback himself, Black really has high hopes for this movie and encouraged all of us to tell other people about it if we like it. We did and we will. Most definitely. Judging by the overwhelming response of applause and laughter to the sold out show this morning, I'd say the gang passed the audition. Two thumbs up!